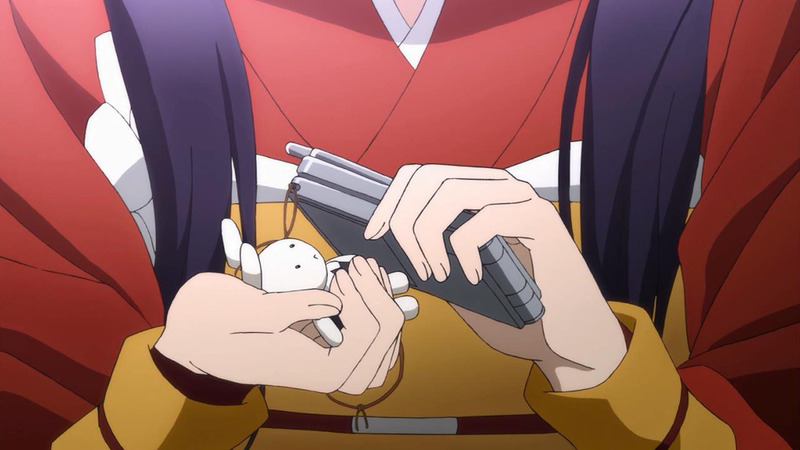 Let me start by saying that this might look like your typical date episode, but it’s actually a nice way to explore Kyouka’s character without forcing it out. 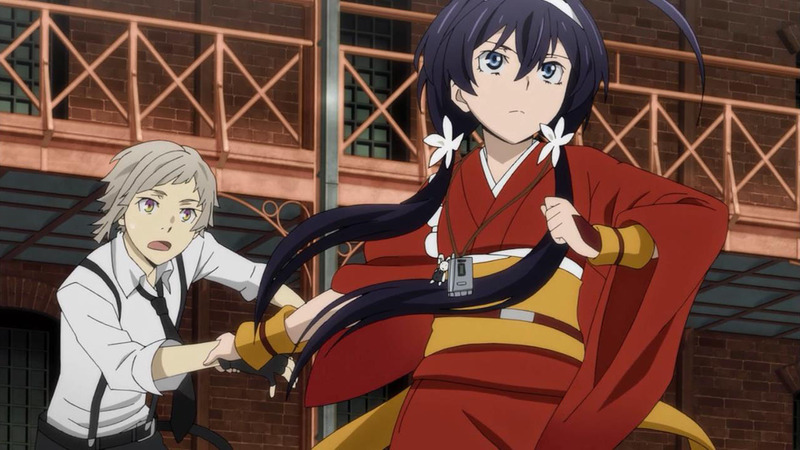 I loved seeing Kyouka and Atsushi’s “date” as they went to visit different attractions, and explored parts of the city. 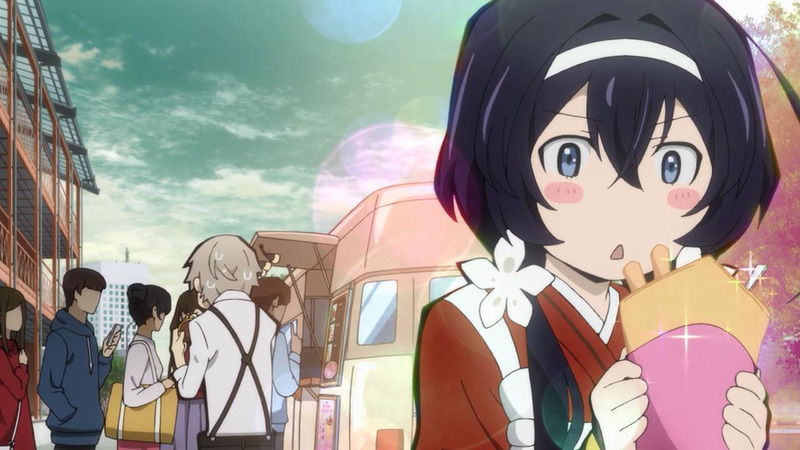 It really looked like Kyouka’s ideal day if she could do anything she wanted as a free kid. 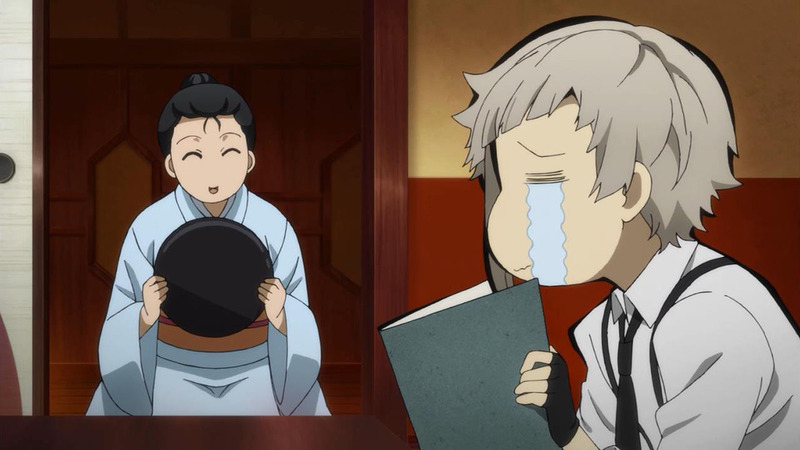 And Atsushi, as another orphan, got to experience it with her even if it means emptying out his wallet. 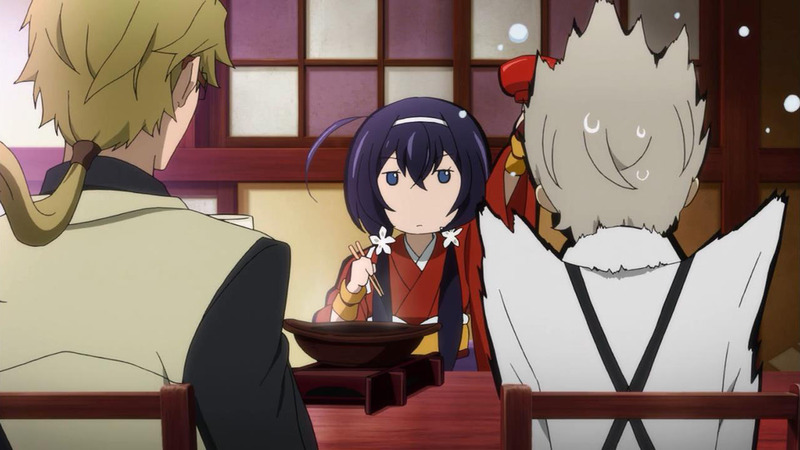 Bungou Stray Dogs isn’t necessarily the most on-point when it comes to its comedy scenes but I did find it hilarious when Kyouka wanted to eat “boiled tofu” (looks like a giant hot pot or shabu shabu pot to me). Is that stuff supposed to be expensive? Oh man… imagine breaking the bank for tofu! 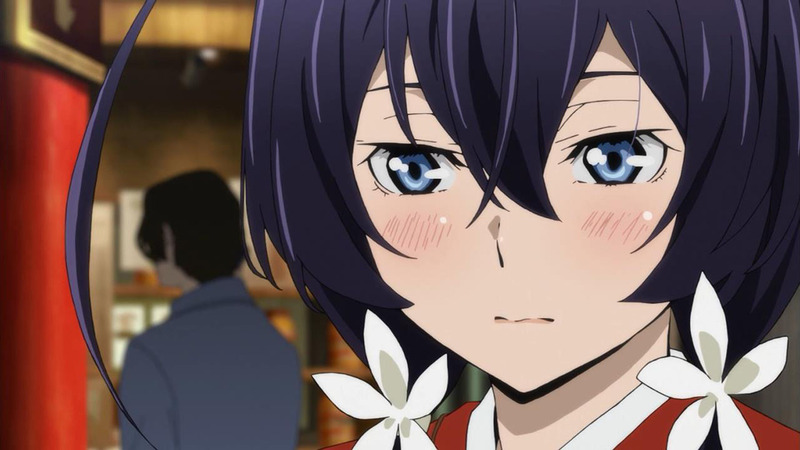 As interesting as Kyouka and Atsushi’s date was, I couldn’t help but get totally engrossed in Dazai’s story instead. I mean – he’s a clear fan favorite here. He steals the spotlight every time. 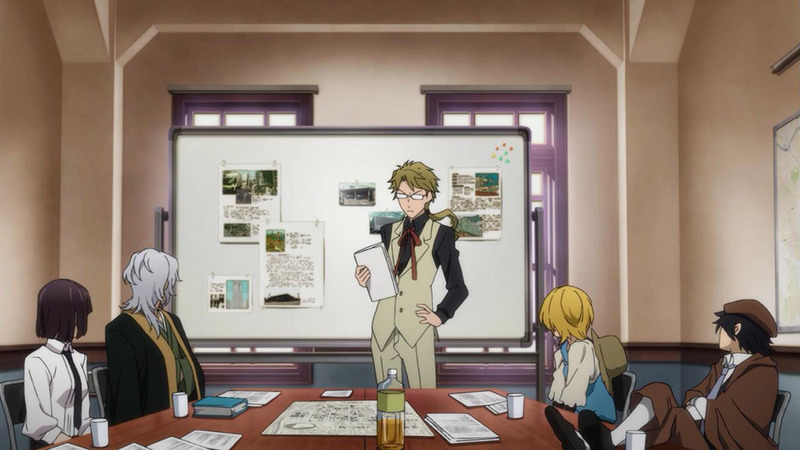 His scenes don’t divulge too much that we didn’t already know, but adding more details to his time as part of the Port Mafia. 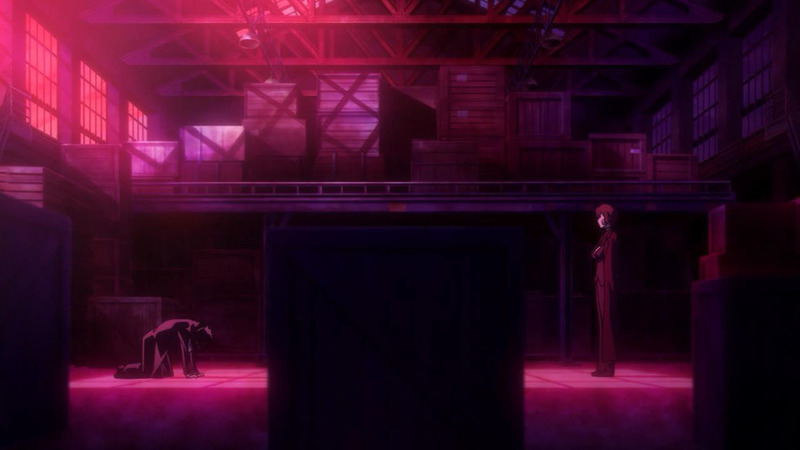 We find out that he was a high-ranking “executive” among the group and Ryuunosuke was his underling. 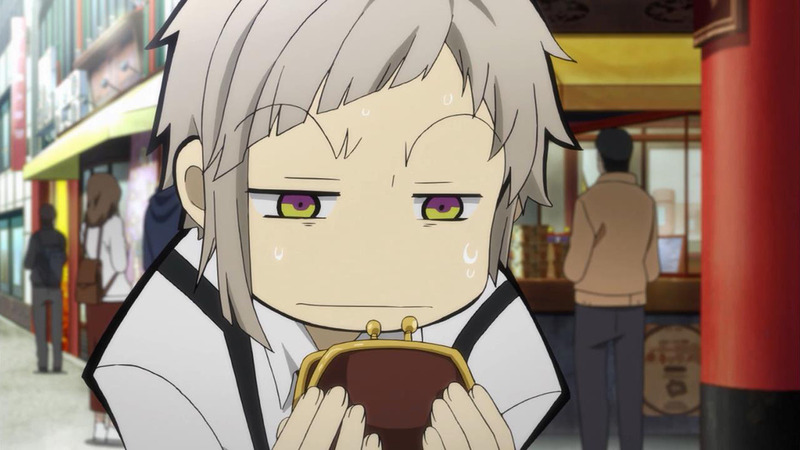 That wasn’t too shocking as the ED sequence already links them up with Atsushi. 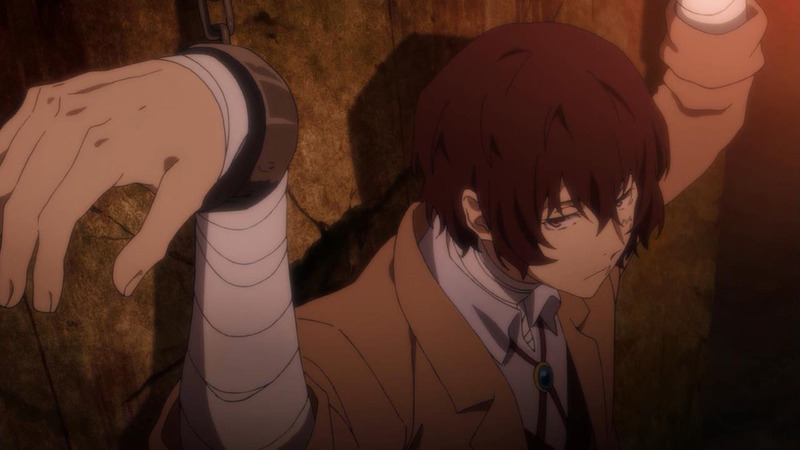 What piques my interest now is what made Dazai leave the Port Mafia or better yet, who? Did he suddenly wake up one day and see the error of his ways? 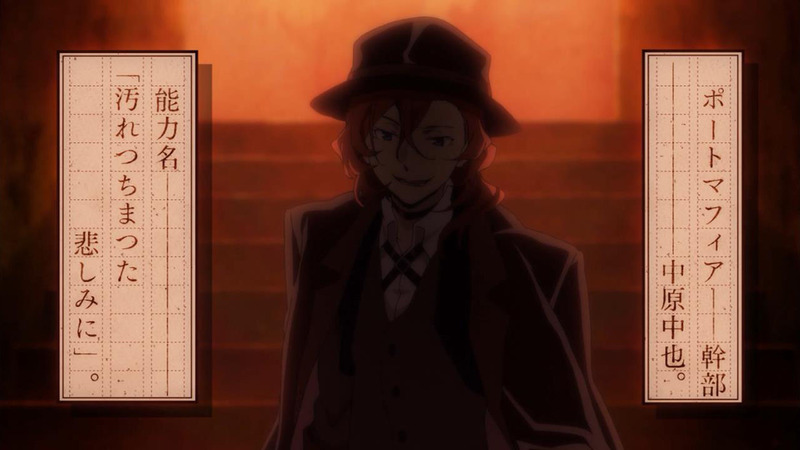 We’re also introduced to Dazai’s old partner in crime, Nakahara Chuuya (Taniyama Kishou) whose ability is “For the Tainted Sorrow”. 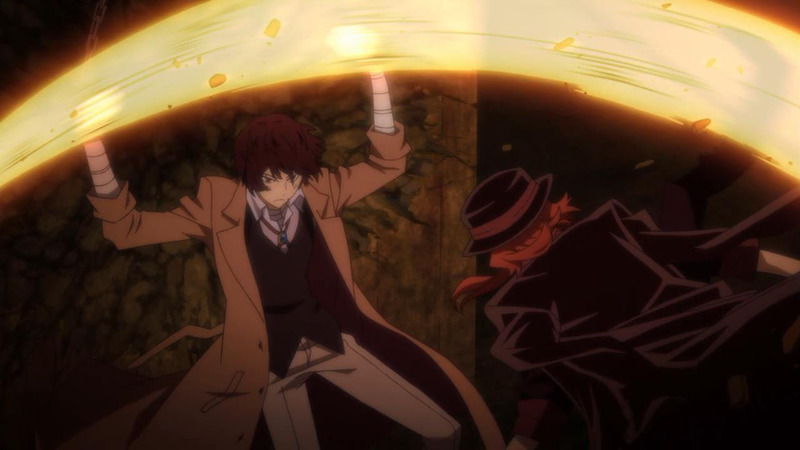 In my opinion, Chuuya seems a lot smarter than Ryuunosuke (who is short-tempered and quick to react) and probably already knows his powers won’t work against Dazai. 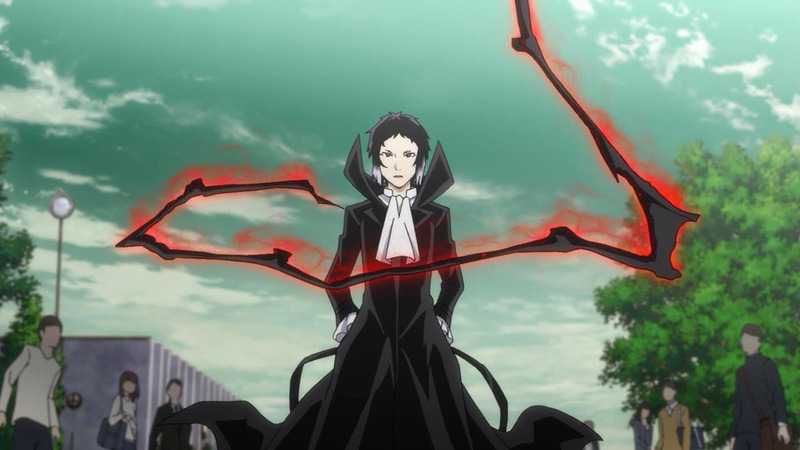 On the other hand, Ryunnosuke seems like he has a lot of built up angst and anger and results to violence a lot of the times. 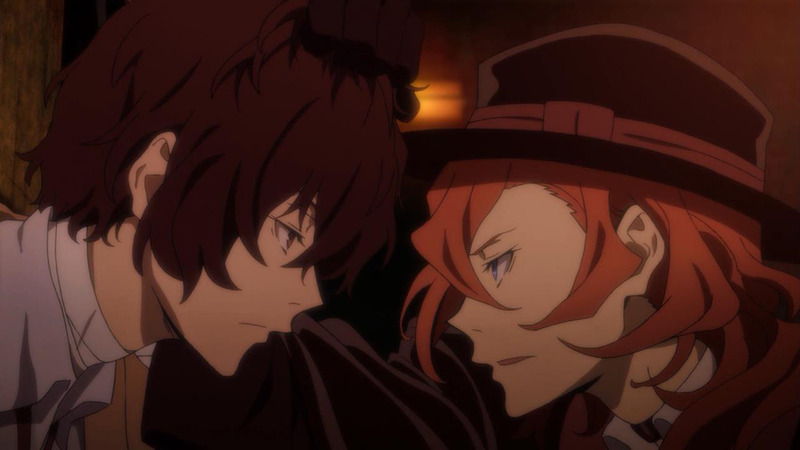 Anyway, all of this just leads us to flesh out the Port Mafia a bit more and Dazai’s backstory so I’m excited to see them again next week. 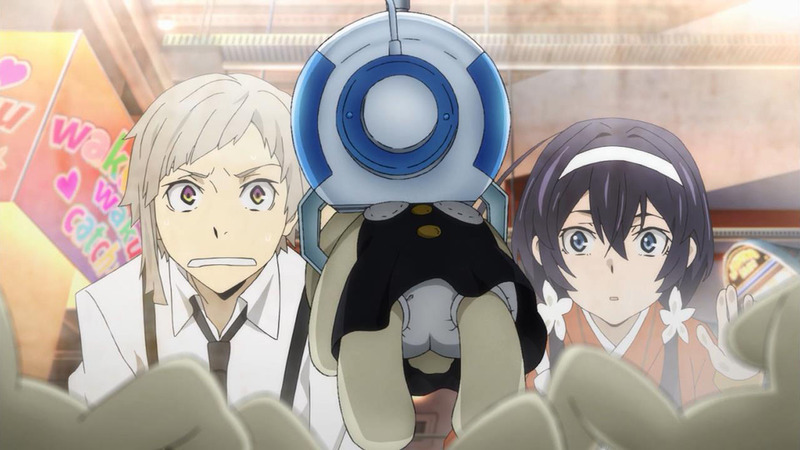 You gotta love how everyone jumps to save Atsushi as soon as they hear about what happened, whereas Dazai has been missing for far longer and no one bothers to look for him… hmmm… but surely Dazai can take care of himself. 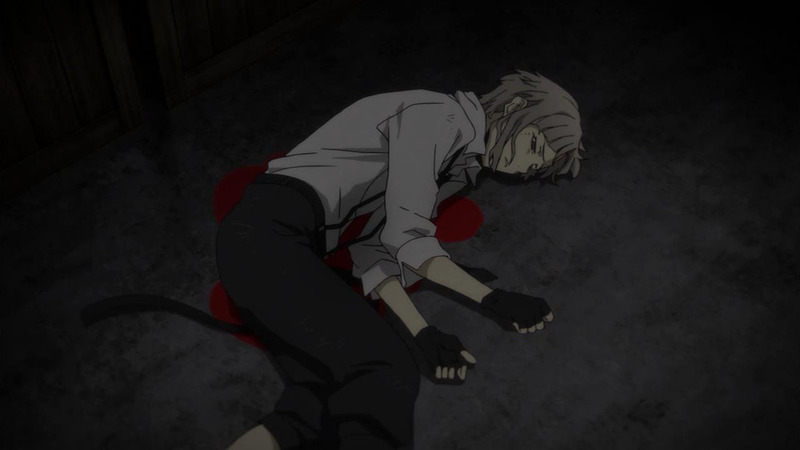 Atsushi, as innocent and genuine as he is, hasn’t done too much to prove his worth in my eyes so I hope he mans up next week. He’s learning to master his powers, one paw at a time, but most of the story is still driven by all the other characters. 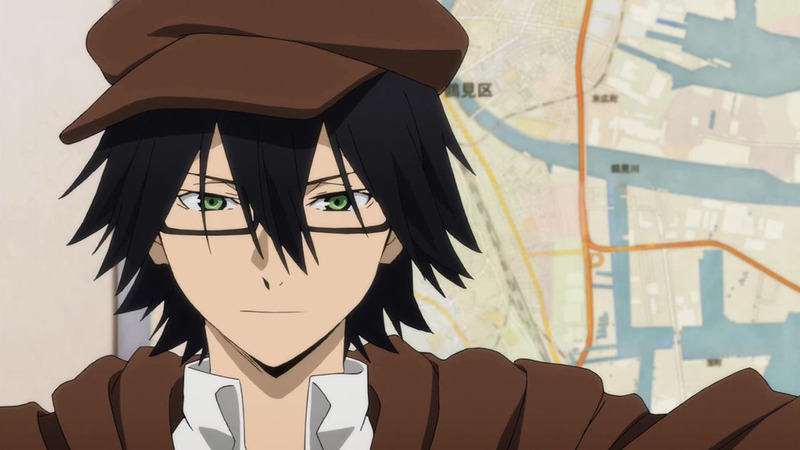 Ranpo is an example of someone that I’ve been eager to see again since his introduction. It’d be a waste to have someone as ingenious as him on your team sitting around doing nothing while everyone is scrambling around. He does behave a bit like a prick though when the President has to negotiate with him just for his assistance. 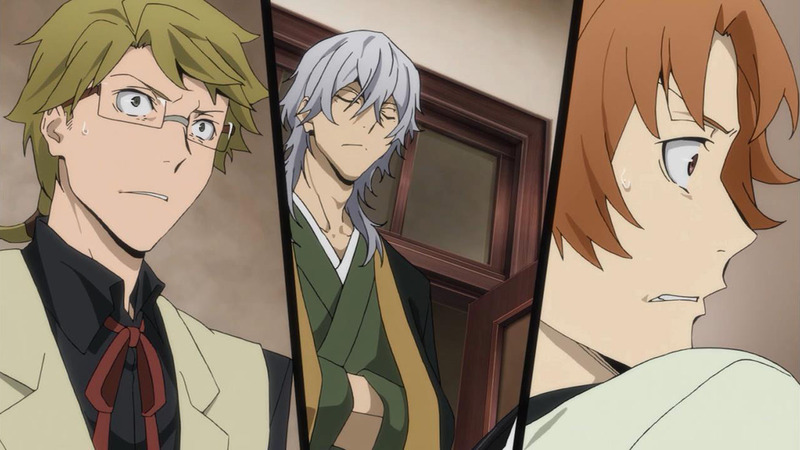 Atsushi is part of the team! Everyone should be full hands on deck! 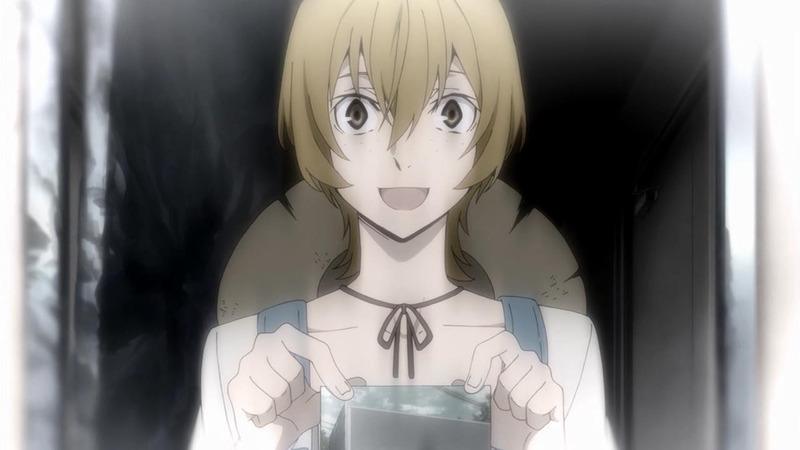 Junichirou is back in action to help as well, even if his discovery leads them down a dead end. 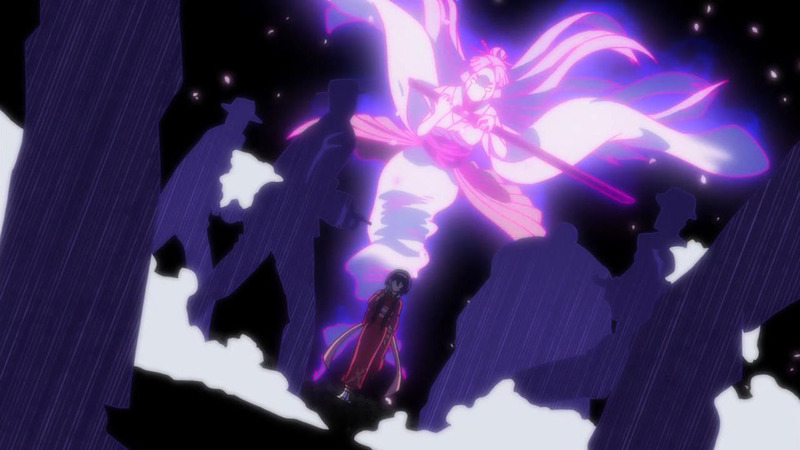 All in all, not a bad cliffhanger for next week as it hypes me up for a bigger battle. 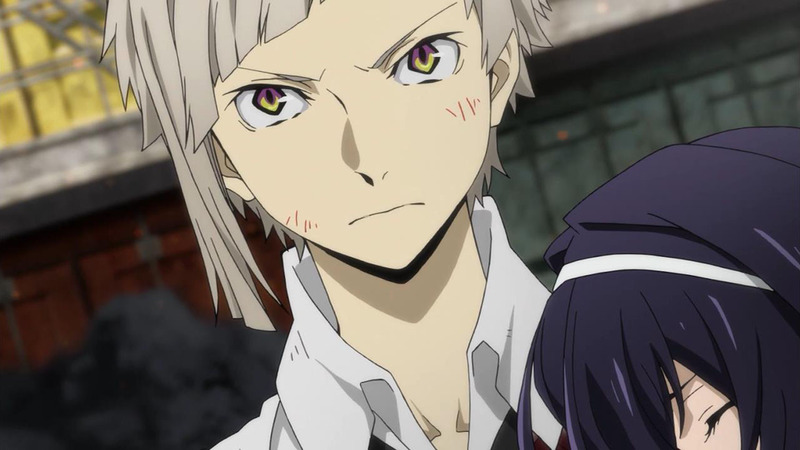 I’m excited to see Atsushi against Ryuunosuke! Haha! 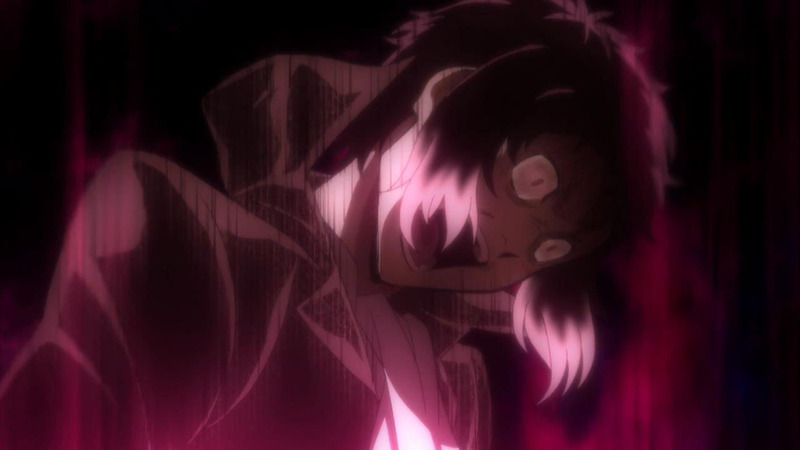 I guess Ranpo also feels the same way. 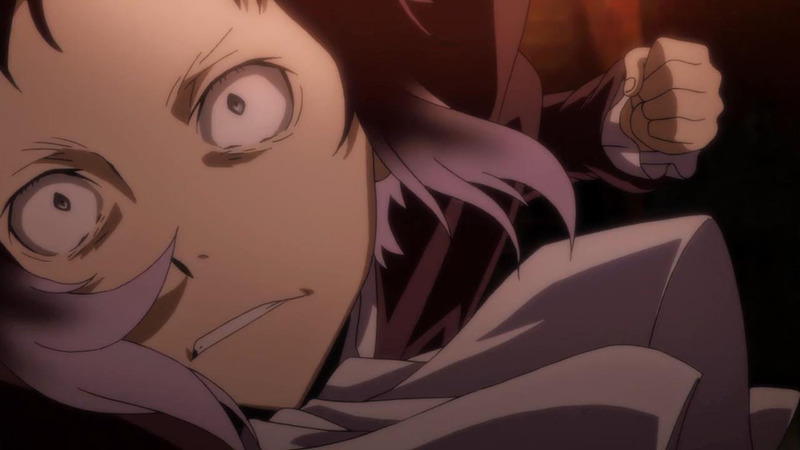 Dazai is one of my favorite characters so far but Atsushi is not far behind, yes, he has made little contribution to the story so far but he developing from a poor kid with zero self-esteem to guy who wants to protect a girl who is in the same abyss he was born into, now I expect he rips apart Ryuunosuke next week!. 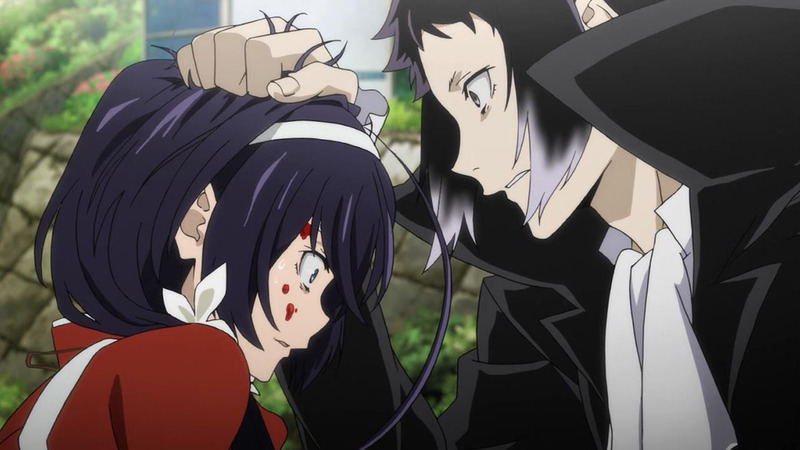 I love this episode even more than the previous one; really, I think that BSD is stronger when it follows the manga. 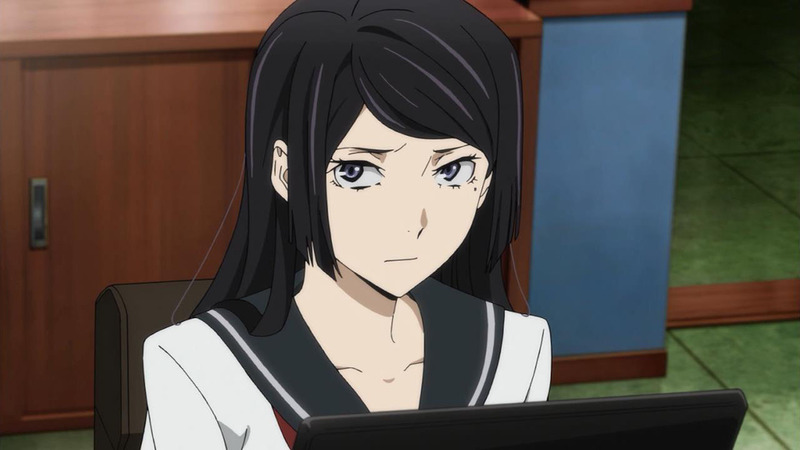 Kyouka’s maturity and awareness of the situation she is in despite her 14 years was admirable yet painful to watch -the police station scene was quite depressing, and then Akutagawa just had to come and rain on their parade. 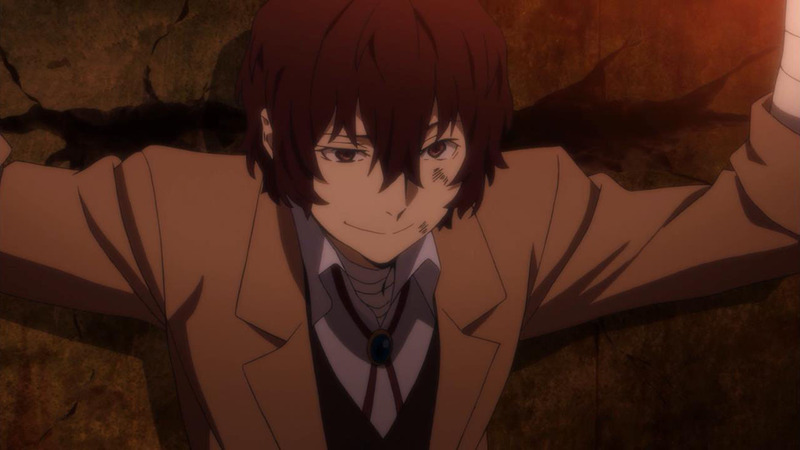 Dazai’s unnatural calm is not too unexpected, given that he has proven to be much more wily and well-prepared than he looks. 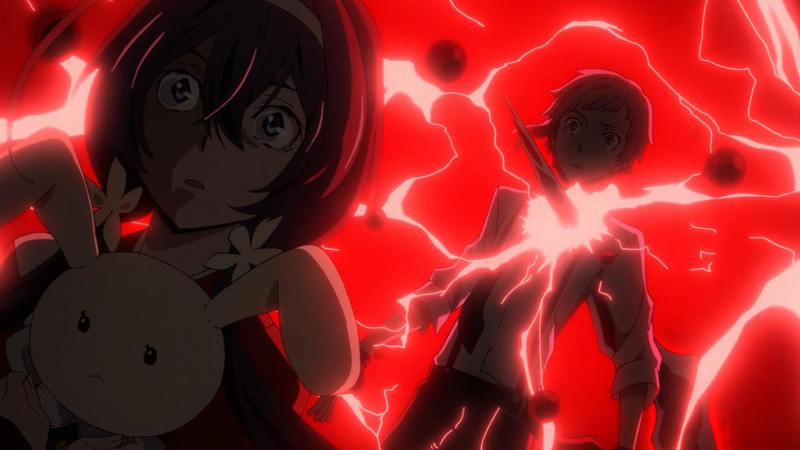 Anticipating more badass action and maybe angst the coming episode, based on the title. 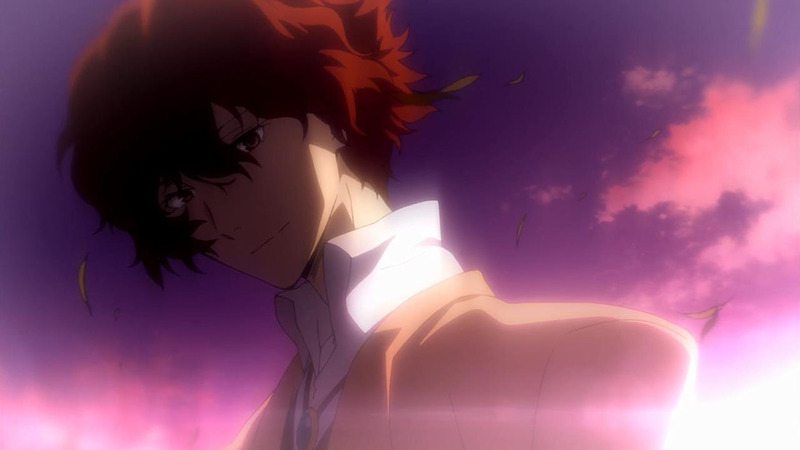 Lastly…Chuya has appeared!! 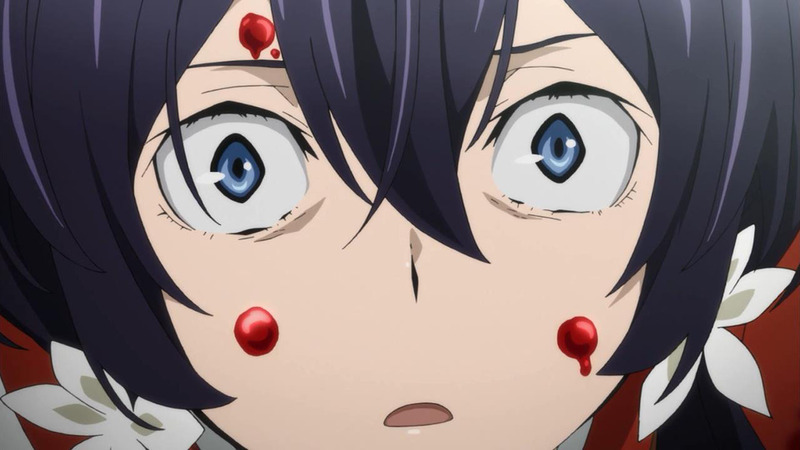 I’ve been waiting for nine episodes; initially I thought that he would have a more squeaky voice, but Taniyama Kishou does manage to give his voice a more mature and menacing edge, so I’m loving it so far. 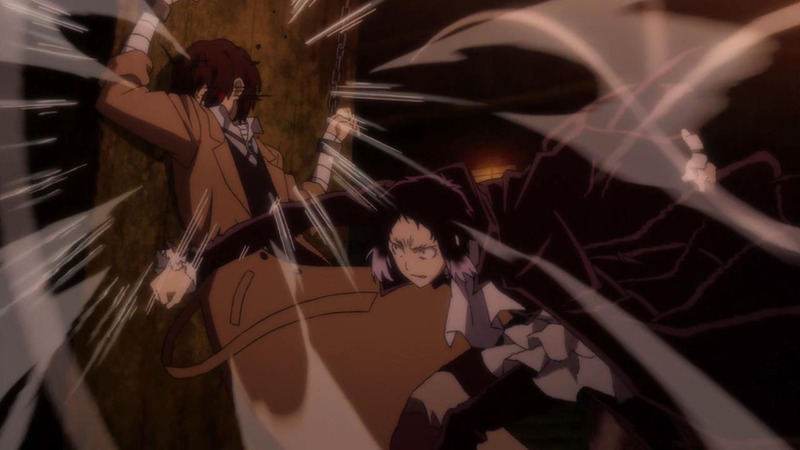 I love Atsushi and I was like ‘we need Dazai here so he can keep the girl’ logic xD but I really kept wondering how they are quick to save Atsushi, while Dazai is.. well, I true your point. 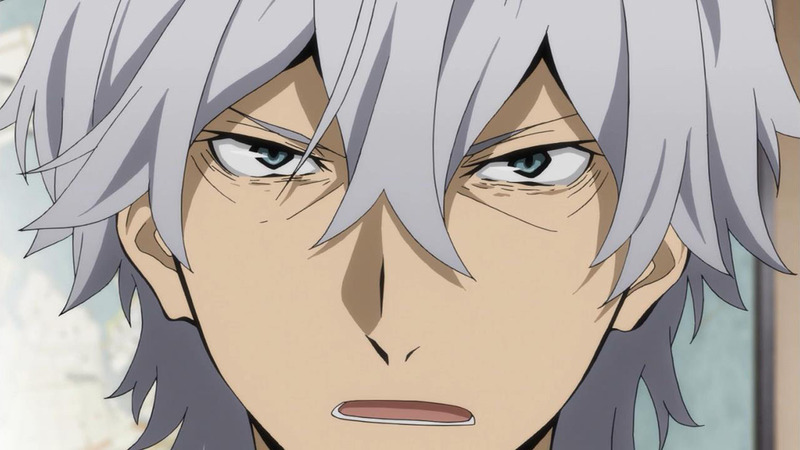 With that said, there are few lines that add to me as a person in anime, and I just added this quote to the list of ‘quotes that make you think’:If you save someone you can’t save, you’ll both end up sinking and the ‘one on your boat’, that is goo-gooh-, very gooh (quoting Tamaki from Ouran lol). 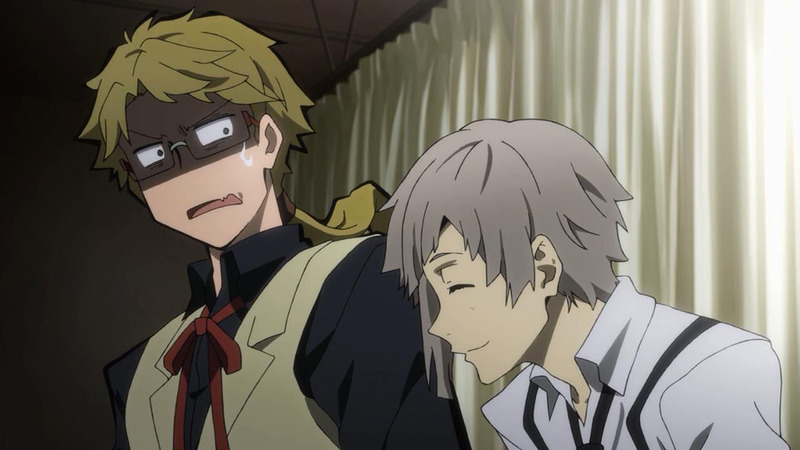 I think this is the episode and the former episode are what’s helping my impression of Atsushi. 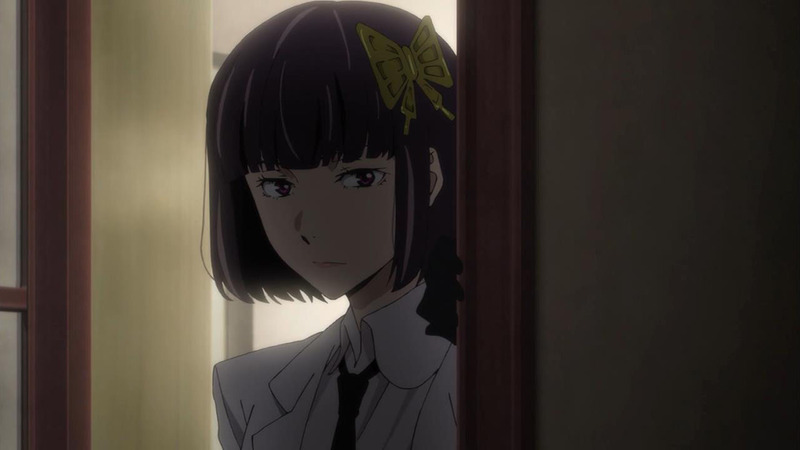 For the first seven episodes, Atsushi has basicially been a coward with little redeeming qualities except self pity and his willingness to sacrifice himself for others. 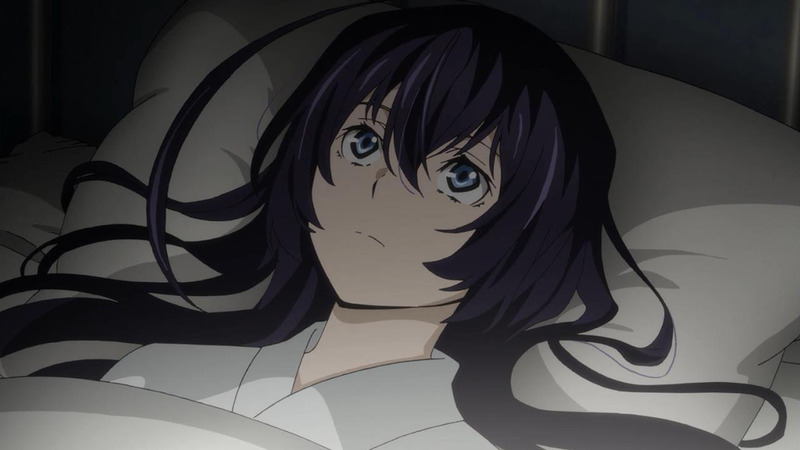 However, now he’s finally confronting his worries as he meets Kyouka, someone with a similar backstory as him and who is going through similar pain. Slowly but surely, he’s taking the steps necessary to move on and live as a person. 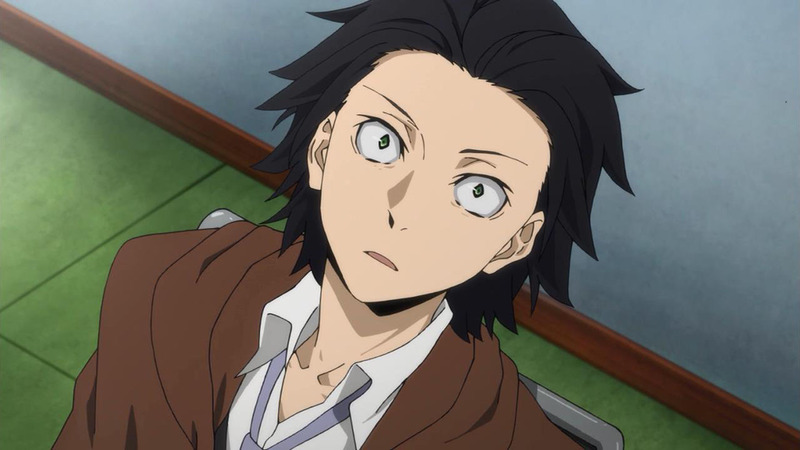 But yeah, I’m excited for next episode to see him save Kyouka! 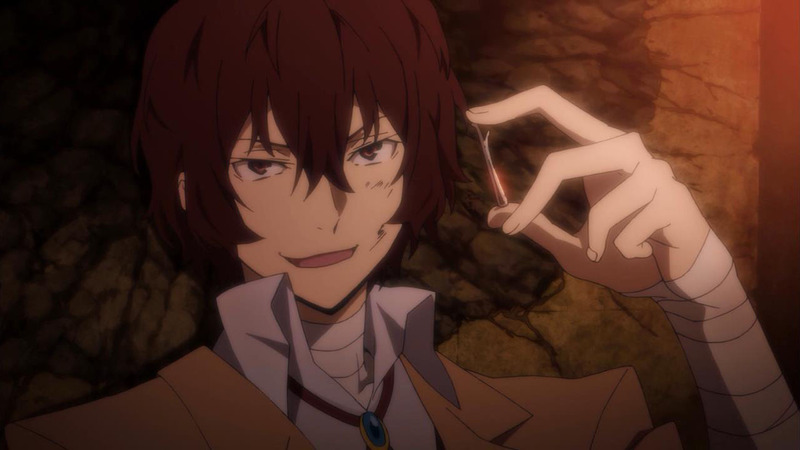 And of course, Dazai is a humorous character and It was nice to learn more about him a bit. I personally think it’s a bit awkward how he makes a lot of suicide jokes, because it’s insensitive to people who actually go through depression and consider suicide. 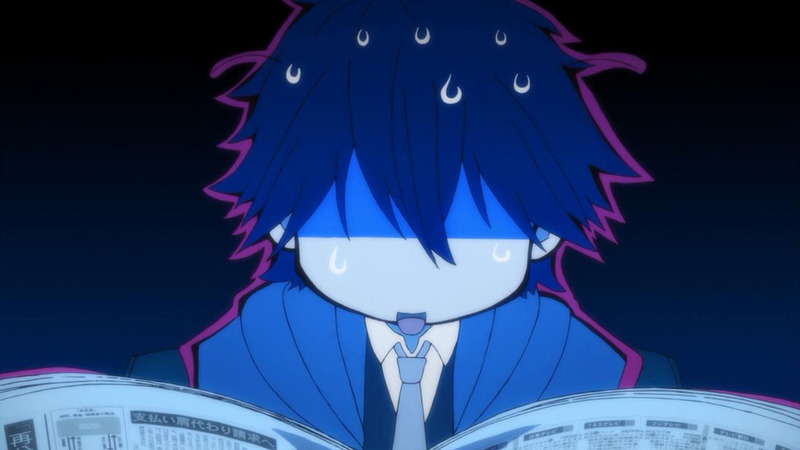 Aside from that, his whimsical personality is enjoyable. 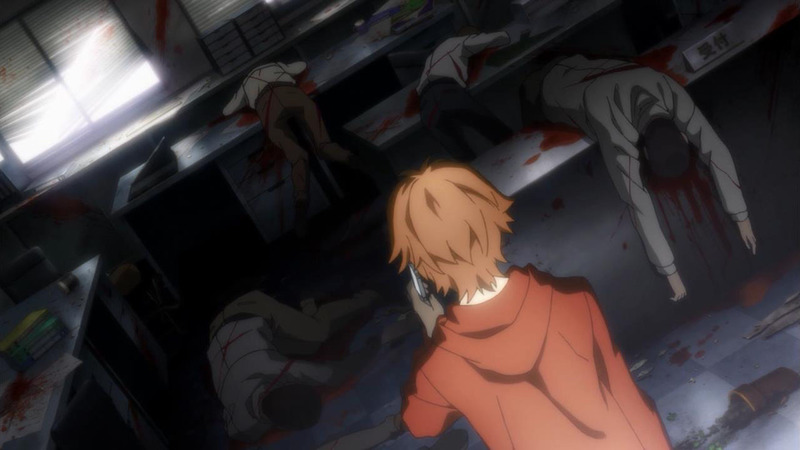 Is it me or did we just gloss over how kunkineda and Rampo was just going to let the kid die? It’s going to be hard buy any relationship they try to forge from the episode on. I found it truly ugly the way those two acted. I know he’s new the team but points down for those two.